RC Fasteners & Components offers a wide variety of circuit board standoffs, spacers, and other electronic hardware. As distributors for some of the industry’s leading manufacturers, including Fascomp Electronic Hardware, RAF Electronic Hardware, and Lyntron, we can offer the highest quality products at factory direct prices. We maintain a huge inventory of electronic hardware and electromechanical components for various applications, in both metric and inch-measure sizes. 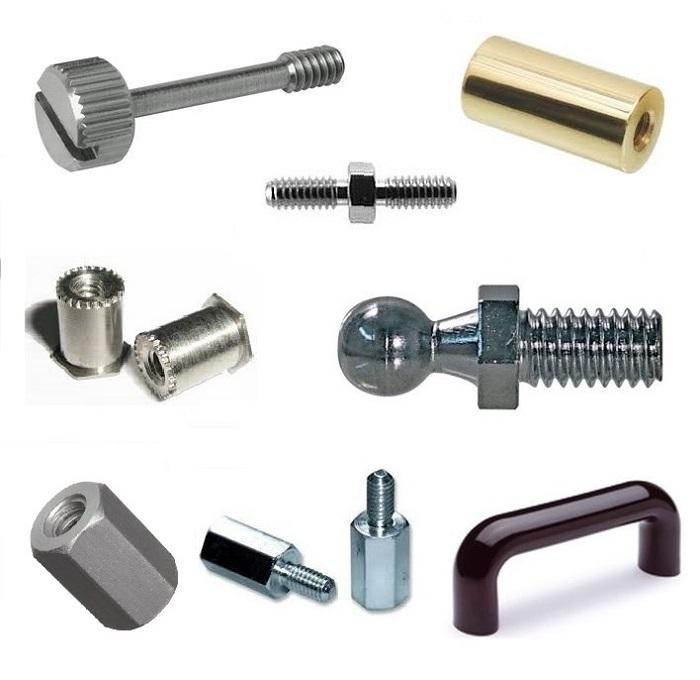 RC Fasteners & Components supplies top quality electronic hardware at competitive prices. We carry captive panel screws, handles, shoulder screws, wire management products, jackscrews, and much, much more. We also stock a large array of miniature components, such as extremely small nuts, screws, and washers. We are your all-in-one electronic component and fastener superstore! For pricing, availability, and FREE SHIPPING, click the blue category buttons below to enter our online store. Commonly used in PC boards, electronic panel assemblies, and other applications where fastener loss is a concern, captive panel screws feature an unthreaded shank with a threaded end. These screws are often used in conjunction with retainers or other electronic hardware to create a self-captivating fastener that can be loosened without being removed from the assembly. Female standoffs (also called female to female standoffs) are used to join two components via threaded fasteners and hold them apart at a specified distance (usually to raise one component above another). These standoffs are comprised of a hexagonal or cylindrical shaft with an internally threaded opening on each end into which connecting fasteners can be installed. We offer female standoffs in a variety of lengths to meet the needs of your electronic assemblies. Metric female standoffs function the same as the above, but are available in metric sizes. Designed to join two components and maintain the specified distance between them (usually raising one component above another), male-female standoffs have an internally threaded opening at one end and an externally threaded shaft at the opposite end. This allows threaded fasteners to be attached, while the standoff itself also serves as a threaded fastener. Various lengths are available, with hexagonal or cylindrical bodies. Metric male female standoffs function the same as above, but are available in metric sizes. Manufactured to tighter tolerances than “standard” shoulder screws, precision shoulder screws are commonly used as precision spacers in rotational or sliding applications. We stock socket head and slotted head precision shoulder screws in a range of materials and finishes to meet your requirements; multiple options are available for locking applications, as well. Most often used to maintain minimum clearance space requirements in applications with tight tolerance requirements, electronics spacers are unthreaded, cylindrical or hexagonal tube-like devices through which fasteners are inserted. Spacers allow fasteners to be fully tightened while maintaining the necessary spacing between components. Multiple diameters and lengths are available. Featuring a knurled outer surface that gives users a better grip, thumb screws are commonly used for applications that require periodic manual adjustments and where finger tightening is sufficient. We offer plain and washer face thumb screws in a range of sizes, materials, and finishes to meet your fastener requirements. Whether you need a few dozen parts, a few hundred, or a few hundred thousand, we can provide the electronic hardware you need in the quantity you require. (Low minimums do apply.) RC Fasteners & Components provides exceptional customer service and fast shipping to get you the right parts for your needs, at the right prices, right away. Order today, request a quote, or contact us to discuss your electronic hardware requirements.